Gilbert made nine different types of steam engine as shown below. Click on any of the engine pictures below to see the various models of that type engine. #21160 Reading 4-4-2 Atlantic. Click the picture to see the rest. #293 New Haven 4-6-2 Pacific. Click the picture to see the rest. 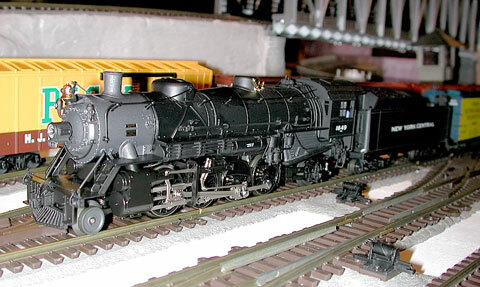 #322New York Central 4-6-4 Hudson. Click the picture to see the rest. #336 Union Pacific 4-8-4 Northern, Gilbert's biggest engine. Click the picture to see the rest. 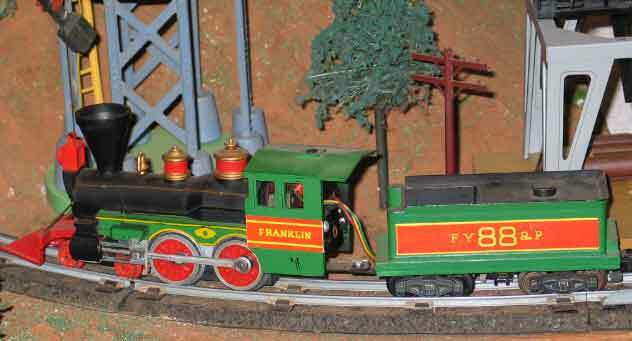 #21088 FY&PRR Franklin 4-4-0 Frontiersman made in 1959 and 1960. Click the picture to see the train it pulled. 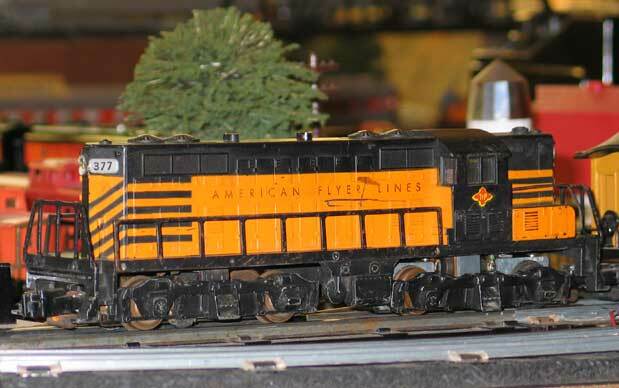 The first fifty of these engines were packaged in specially marked sets. but it is certain they went to special friends of the Gilbert Company. 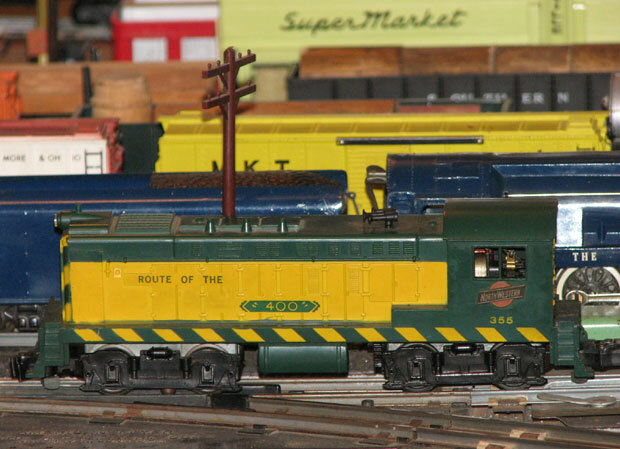 The tender and the set box were both stamped to identify them as "One of the First 50." #21089 FY&PRR Washington 4-4-0 Frontiersman. 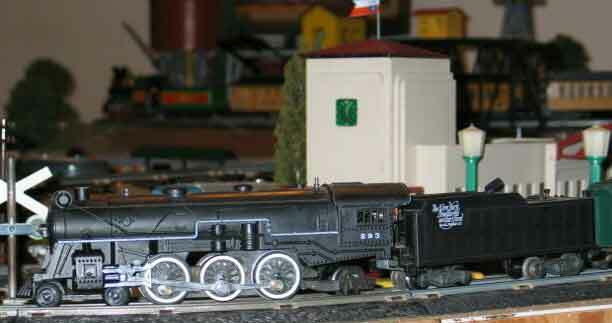 This is a picture I took in Don Mathies' booth at the 2008 Del Mar Train show. #21165 Erie 4-4-0 Casey Jones. Click the picture to see the rest. The Mikado is a new generation of steam engine introduced in 2003 wth all new tooling and electronics. 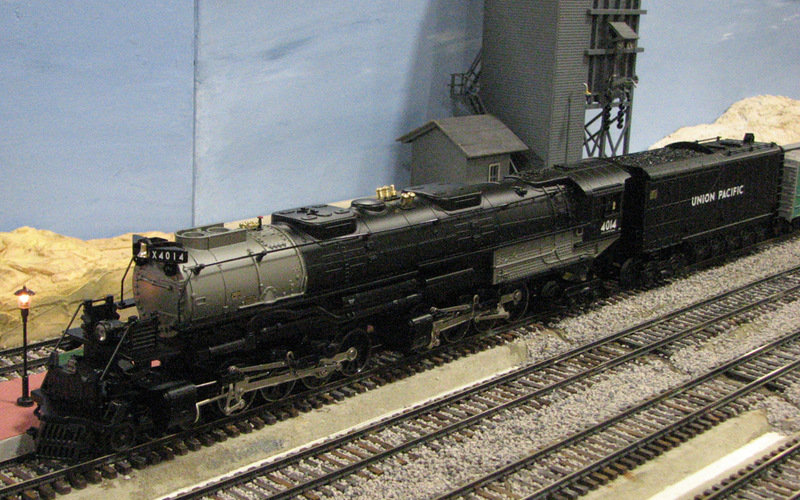 #48070 Union Pacific 4-8-8-4-Big Boy made in 2008. Gilbert made four different types of diesel engine as shown below. 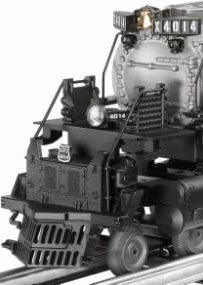 In 2009, Lionel added the U33C (scroll down). #4856 Santa Fe Chief Alcos. Click the picture to see the rest of the Alcos. #377 Texas & Pacific GP-7. Click the picture to see the rest of the Geeps. #355 Chicago & Northwestern Baldwin. Click the picture to see the rest of the Baldwins. 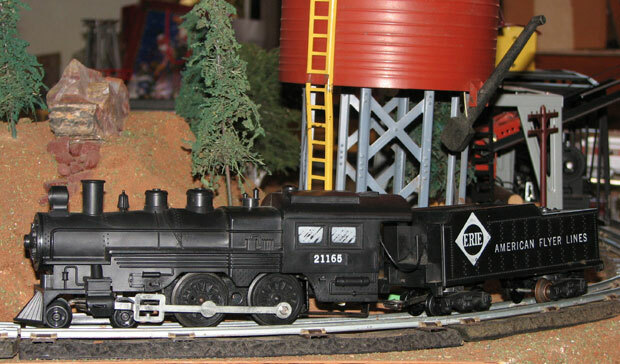 #21206 Santa Fe F-9. Click the picture to see the rest of the F-9s. #48142 Erie Lackawanna U33C made in 2009. 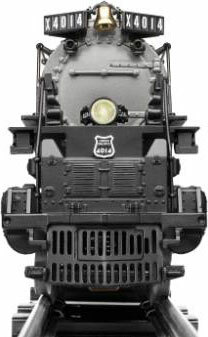 The first totally new American Flyer diesel engine made by Lionel, the U33C uses the Legacy control system. #48146 Southern Pacific U33C made in 2009. 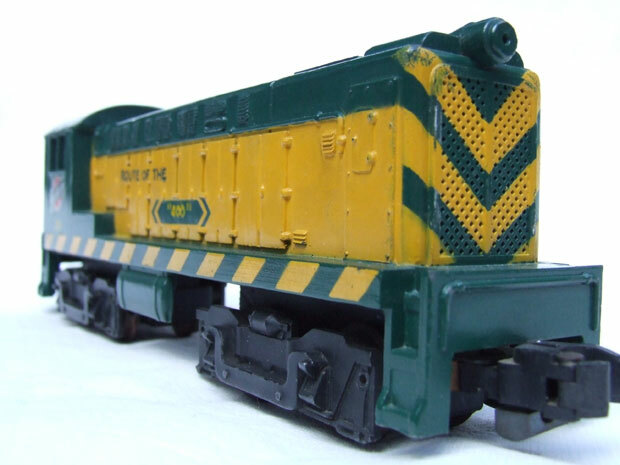 #48008 Hew Haven GE EP-5 Electric.Click the picture to see the rest. 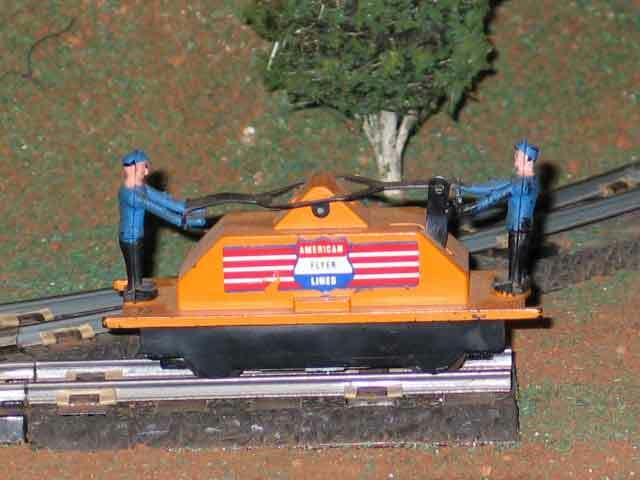 #740 Handcar. Click the picture to see the gallery of Gilbert's hand cars and track maintenance cars. one for photographs included in the catalog and one for the Toy Fair. This is one of the two prototypes of the 355 Baldwin. Click on it for more pictures and information.